To keep the sounds of modern life at bay, or for just a night of quiet sleep, Moldex disposable earplugs rate best. For concert goers, Etymotic earplugs turn down the volume without squelching the sound quality. 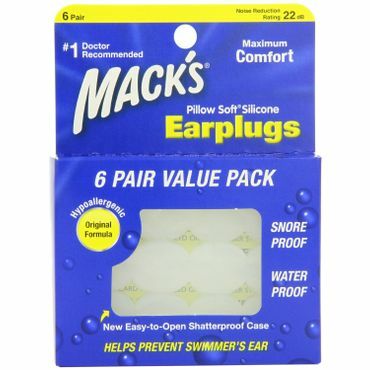 Mack's earplugs are a top choice for swimmers. Moldex 6800 Pura-Fit earplugs have a noise reduction rating of 33 dB, the highest level of noise blocking available among disposable earplugs. Reviewers say they block out noise effectively at night and also fit securely under a motorcycle helmet. 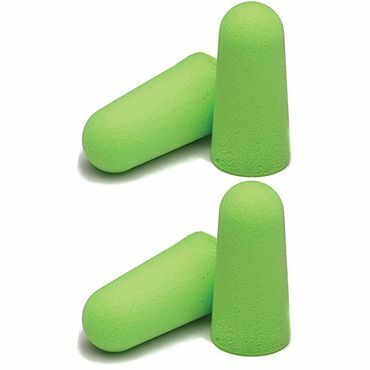 Users describe these soft foam earplugs as effective and comfortable to wear, even for long periods of time. Most owners find them easy to insert and remove, and the individual paper pouches for each pair of earplugs are a plus. Etymotic ETY Plugs are high-fidelity earplugs that reduce overall noise volume by up to 20 dB without affecting sound quality. Although they're not the best overall noise blockers available, users love them for protecting their hearing at concerts and in other noisy settings. Reviewers say the plugs are comfortable, as long as you choose the right size for your ears (standard or large). They're more expensive than foam earplugs, but they can be reused for months. In two clinical trials, Mack's Pillow Soft do better than any other earplugs at keeping water out of testers' ears. These moldable silicone earplugs fit over the opening to your ear canal, rather than inside it, and can be reused several times. Their noise reduction rating is 22 dB – enough to blunt, if not entirely block, most everyday noises. Users say they're a little hard to apply, but once they're in place, they're typically comfortable and secure. In the modern world, noise is all around. Working with power tools, riding a motorcycle or a snowmobile, firing a gun at a shooting range, or even listening to loud music at concerts and clubs can expose you to noise levels high enough to cause permanent hearing damage. The National Institute on Deafness and Other Communication Disorders (NIDCD) estimates that as many as 24 percent of adults aged 20 to 69 have some level of noise-induced hearing loss. Fortunately, avoiding this problem can be as simple as donning an inexpensive pair of earplugs. These small cylinders, made of materials like foam, plastic, silicone, or wax, are designed to protect your hearing in a noisy environment. Users rely on them for attending concerts, riding a motorcycle, or mowing the lawn. They also come in handy for blocking out general noise from traffic or neighbors, so you can sleep or study; a few reviewers even quip that earplugs have saved their marriages by drowning out their mates' loud snoring. Swimmers and surfers wear earplugs to keep water from getting into their ear canals, where it can cause bacterial or fungal infections known as "swimmer's ear." Earplugs for swimming can be reusable silicone plugs that "screw" into the ear canal or moldable balls of silicone or natural wax that form a seal over the outside of the ear. This type of earplug can also be useful for air travel, helping to relieve the discomfort caused by changes in air pressure. 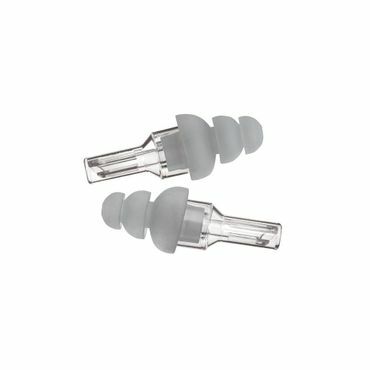 Earplugs can be disposable, semi-reusable (meaning they should be thrown out after a few uses), or entirely reusable. Disposable earplugs generally cost anywhere from 10 to 70 cents per pair, though the price typically goes down if you buy in bulk. Reusable earplugs will set you back anywhere from $1 to $20 per pair, with semi-reusable earplugs at the bottom of this range. Other options include custom earplugs, which are molded specifically to the shape of your ears, and electronic earplugs, which actually contain tiny microphones and amplifiers to pick up ambient sound and automatically adjust the level that gets transmitted to your ears. These types, which can cost anywhere from $25 to $400, aren't covered in this report. All noise-blocking earplugs carry a noise reduction rating (NRR) -- a measure of how many decibels (dB) sound is reduced when you're wearing them. Decibels are logarithmic units used to measure sound, which means that every increase of 10 dB represents a tenfold increase in the sound volume. According to the NIDCD, a whisper is about 30 dB, normal conversation is 60 dB, and an ambulance siren is 120 dB. Sounds over 120 dB are loud enough to cause pain, but any sound over 85 dB can cause hearing loss with prolonged exposure. The higher the NRR of your earplugs, the better it can shield you from hearing damage. However, because of the way sound is measured, you can't simply subtract the NRR from the total noise volume. Cooper Safety explains how to calculate the actual noise reduction in decibels a set of earplugs can provide: first subtract 7 from the NRR, then divide the result by two. For instance, if you're at a rock concert where the overall noise level is at 100 dB, wearing NRR 33 earplugs will drop the amount of noise reaching your ears by 13 dB -- (33-7)/2 = 13 -- to 87 dB – still quite loud, but safe for a few hours. However, NRR isn't the only factor to consider when choosing earplugs. Experts and users agree that a good fit is just as important, because an earplug can't do its job if it falls out, doesn't seal properly, or is so uncomfortable you can't wear it. Most earplugs are one-size-fits-all – and sized for men – so it's important to try a variety to find which one works best for you. Some brands come in small sizes to provide a better fit for children and adults with smaller ear canals. In addition to NRR and fit, you should consider how well the earplugs are suited to the activity you have in mind. For instance, motorcycle enthusiasts need earplugs that can fit well under their helmets, as well as dampen the sound of wind and engine noise. Musicians require earplugs that attenuate sound across all frequencies to preserve the quality of the music, while muting the loudness. Swimmers and surfers need water-blocking earplugs, and frequent flyers need earplugs that can regulate air pressure without interfering with overhead announcements. "Earplugs for Sleep: Reviews & Ratings"
"Efficacy of Commercial Earplugs in Preventing Water Intrusion During Swimming"
"An Objective Comparison of Leakage Between Commonly Used Earplugs"
To some extent, which earplugs are best for you depends on your personal needs and preferences. However, everyone needs earplugs that can do a good job of muting sound (or blocking water, if they're used for swimming), fit comfortably, and provide good overall value. To find the best choices, we looked at professional comparison tests, but such feedback is limited. We did spot a few helpful reports, however, including one test of a dozen earplug choices by Your Best Digs. We also consulted available medical studies. User reviews complete the picture. We looked at feedback at Sleep Like The Dead, a meta-review site that draws in and consolidates user feedback posted across the web. We also personally analyzed hundreds of user reviews at sites like Amazon and Walmart to find the earplugs that are your best bets for quiet and comfort.